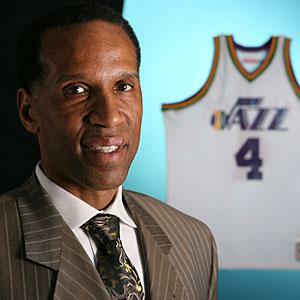 Adrian Delano Dantley was born on 28 February 1955, in Washington, D.C. USA, and is a retired professional basketball player, who played in the National Basketball Association (NBA) for 15 seasons. He is a six time NBA All-Star, playing in the forward and guard positions. All of his efforts have helped put his net worth to where it is today. How rich is Adrian Dantley? As of late-2016, sources inform us of a net worth that is at $1.5 million, mostly earned through a successful career in professional basketball, including being the acting head coach of the Denver Nuggets in 2010. He is a member of the Basketball Hall of Fame. All of these achievements have ensured the position of his wealth. Adrian attended DeMatha Catholic High School and played basketball during his time there. After matriculating, he attended Notre Dame and played as a forward from 1973 to 1976. Thanks to his performances, he became a consensus first-team All-American for two years, and also held records with the school, leading the team in scoring for most of his time there. He was also responsible for helping the Fighting Irish break UCLA’s 88 game winning streak in 1974. He also joined the 1976 US Olympic team that won the gold medal. In 1976, Adrian was drafted as the sixth overall pick by the Buffalo Braves. Thanks to his performance, he was named the NBA Rookie of the Year Award in 1977, and this would be the start of his increase in net worth. He was then traded to the NBA Pacers, but after playing just 23 games there, moved to the Los Angeles Lakers, where he stayed for a season before being traded to the Utah Jazz. He started becoming known as a scorer with Utah and led the league twice in the scoring category. In 1983, he missed 60 games due to an injury, though for his remaining years in Utah, he was selected for the All-Star games. During this period, he continued to build up his net worth. In 1986, Dantley was traded to the Detroit Pistons, and needed to score less due to good performances from the rest of the team. Three years later, he was traded to the Dallas Mavericks where he played two more seasons before finally retiring after a short 10-game stint with the Milwaukee Bucks. At the end of his career, he tied the record for most free throws made in an NBA game – 28 – with Wilt Chamberlain. In 2007, Utah retired his jersey number and he was eventually elected to the Basketball Hall of Fame 16 years after his retirement, in 2008. After his playing career, Adrian started working for the Denver Nuggets as an assistant coach, for eight seasons, and then had a run as being the head coach during the 2009 season when George Karl was battling cancer. He also coaches basketball in Silver Spring, Maryland. For his personal life, it is known that he is married to Dinitri, and they have three sons – Cameron Dantley would play college football as a quarterback for Syracuse Orange. Adrian is also known to be frugal and even worked as a school crossing guard due to the health insurance benefits as the NBA no longer offered them to retired players. 2 Inducted into the Naismith Memorial Basketball Hall of Fame in 2008. 3 Forward/Guard for the Buffalo Braves (1976-1977), Indiana Pacers (1977), Los Angeles Lakers (1978-1979), Utah Jazz (1979-1986), Detroit Pistons (1986-1989), Dallas Mavericks (1989-1990) and Milwaukee Bucks (1990-1991). 4 Named to 6 NBA All-Star West Teams (1980-1982 and 1984-1986). 5 Member of 1983-1984 NBA Midwest Division Champion Utah Jazz team. Member of 1987-1988 NBA Eastern Conference Champion Detroit Pistons team. Member of 1988-1989 NBA Champion Detroit Pistons team. 6 Named 1977 NBA Rookie of the Year for averaging 20.3 Points, 7.6 Rebounds, 1.9 Assists, 1.2 Steals and 36.6 Minutes per game. 7 Named to 1977 NBA All-Rookie Team.